OUG Press Info . . .
ONE - The Unified Gospel. The Original Unified Gospel of Jesus. Authoritative Gospel Reference, Bible. The Unified Gospel of Jesus. ONE is the unification of the four separate Christian Gospels of Matthew, Mark, Luke and John. There may be four source Gospels, but there is only one Gospel of Jesus. Authoritatively documented to the source works with 3,000 references back to the Gospels. Every clause--every clause--in all four Gospels is included and referenced in ONE. Read what people are saying about this unique work. A must-have unique work for the casual reader and scholar alike. Scholarly and easier to read. ONE is a truly unique and important work that everyone should read now. Makes a great gift. Currently shipping the Original Printing. Limited supplies. View Inside (pdf). View Table of Contents. Also available: 5-Pak Special. Want Even More Buying Options? Detailed Description: Christians know that there are four separate Gospels of Jesus: Matthew, Mark, Luke and John. The Gospels describe the life of Jesus, including his teachings and the circumstances of his death with first-hand statements of Jesus himself. However, as Christians also know, none of the four Gospels contain the entire story of Jesus. Only Matthew tells the story of the "wise men" visiting Jesus at birth. Only Luke tells the story of the Shepherds visiting Jesus at birth. Only Mark tells the time that Jesus was crucified. Only John tells the story of Jesus washing the Apostles feet. Only Matthew and Luke share the story of the Poor Woman's Gift. Only Matthew and Mark share the story of the Greatest Commandment. Only Luke tells the "Father forgive them, they know not what they do" quotation from Jesus on the cross. Therefore, to grasp the entire life and teachings of Jesus, the reader must read four books: all four Gospels. Then, the reader must try to remember all the text and integrate it in the reader's mind to understand the entire message. In reality, only scholars have the capability to accomplish such a reconciliation through very detailed study. Everyone else learns about Jesus in bits and pieces. For some, it's just too hard. But, it does not have to be that hard. Using technologies never before available, the author has effective superimposed all four Gospels onto each other and removed duplication. What is left is simply all parts of the four Gospels that are the same and all parts that are different. The one unified Gospel that transcends all four testimonies. Now, in only 230 pages--shorter than most novels--the reader gets the entire message of Jesus with greater clarity and impact. Although some will find this work suitable for their entire study of Jesus, this work is intended to supplement and not to replace the source works; however, after reading this work, because of its clarity, impact and ease of reading, the reader should have a far greater understanding of the original Gospels and the life and teachings of Jesus. For the preacher, student and scholar, the author has documented the unification process in a 56-page Unification Index that contains 3,000 references back to the original source Gospels. Each of those 3,000 references cites back to as many as four of the source Gospels, depending upon how many sources were used for the particular text. Then Peter approaching asked him, 'Lord, if my brother sins against me, how often must I forgive him? As many as seven times?' Jesus answered, "You should forgive him, not seven times but seventy-seven times. Be on your guard! If your brother sins, rebuke him; and if he repents, forgive him. And if he wrongs you seven times in one day and returns to you seven times saying, ‘I am sorry,’ you should forgive him. Then Peter approaching asked him, "Lord, if my brother sins against me, how often must I forgive him? As many as seven times?”  Jesus answered,  “Be on your guard! If your brother sins, rebuke him; and if he repents, forgive him. And if he wrongs you seven times in one day and returns to you seven times saying, ‘I am sorry,’ you should forgive him. I say to you, not seven times but seventy-seven times." 1707 Then Peter approaching asked him, "Lord, if my brother sins against me, how often must I forgive him? As many as seven times?” 1708 Jesus answered, 1709 “Be on your guard! If your brother sins, rebuke him; and if he repents, forgive him. 1710 And if he wrongs you seven times in one day and returns to you seven times saying, ‘I am sorry,’ you should forgive him. 1711 I say to you, not seven times but seventy-seven times. In this way, ONE reads as easily as novel for the casual reader, with greater impact and clarity, and the preacher, student and scholar and source the [1707-1711] references back to the Unification Index, and then back to the divine works. If you want to see more examples of why unification works, see Unification Samples and the View Inside pages. ONE is a truly unique and important work that everyone should read now. Softbound. Buy E-Book. Buy Audio CD (Listen to Sample). 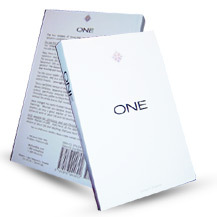 One, by Gregg Zegarelli, is the Unified Gospel of Jesus. It is the only fully-referenced unified gospel available anywhere at any price. It is a harmony of the Gospels of Jesus. One is the Unified Consolidated Integrated Gospels of Matthew, Gospel of Mark, Gospel of Luke and Gospel of John. It is a parallel of the Gospels. Your religious library is not complete without this special study bible; a parallel gospel within a harmony of the gospels. Truly a work of inspiration. It will inspire you. Copyright © 2006 by OUG Press, Ltd. All Rights Reserved.